Denny Tipps, father of avid hunter and angler, Dylan Tipps (click HERE for his story), has shown Dylan a thing or two over the years, and managed to find this beauty of a non-typical buck himself. Denny saw this unique buck bedded down approximately 465 yards away from where he was and took the shot, successfully. This particular deer has four antlers, and Denny refers to him as a 6x2x1x1. Talk about a one-of-a-kind find! 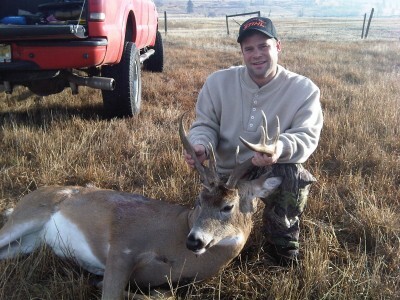 I guess getting these non-typical bucks runs in the family, as Dylan’s first buck was a non-typical mule deer. The saying “like father, like son” definitely applies to Denny and Dylan!